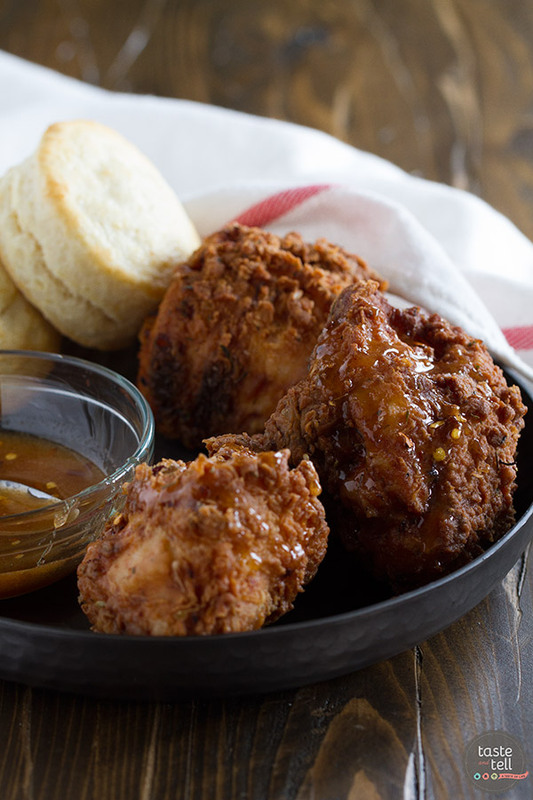 Get ready to have your mind blown – this Honey Fried Chicken with Hot Honey Sauce and Biscuits just may be the moistest, most delicious fried chicken recipe you’ve ever had. 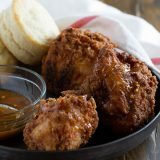 Served up with buttermilk biscuits and a sweet and spice Hot Honey Sauce, this is one recipe that is sure to impress. I have been cooking for quite some time now. Cooking pretty extensively for quite awhile. And obviously, since I’m a food blogger, I’m often trying new recipes. As many recipes as I’ve been through the last few years, though, I don’t tend to stray too far from what I know. What I’m comfortable with. But sometimes, you need to break those comfort zones, and go big or go home. Today’s cookbook review helped me to do just that. 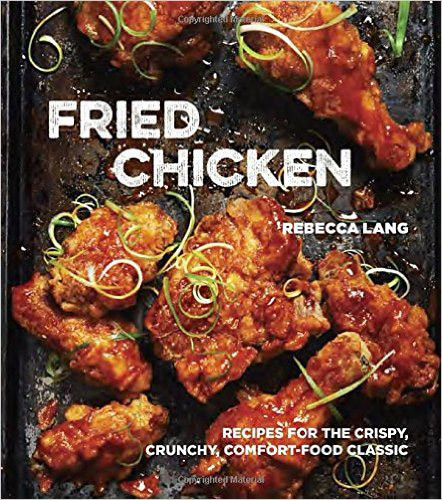 Fried Chicken by Rebecca Lane is filled with more than sixty fried chicken recipes. This book is a fried chicken lover’s dream come true. As much as I like fried chicken, I have never actually deep fried chicken at home. And I had never cut my own chicken, either. This book allowed me to get out of my comfort zone and try 2 new things that were kind of scary to me before. I first have to say that this book is filled with some amazing sounding recipes. I had a hard time narrowing it down, but still couldn’t decide once I had a few chosen. So I actually took it to Snapchat, and let people on Snapchat decide for me! (And they chose a winner – that’s for sure! 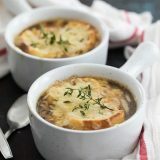 More on the recipe below!) But this one recipe won’t be my last. Now that I know how good homemade fried chicken is, you can bet that there will be more coming out of my kitchen. Number of Photos: some. 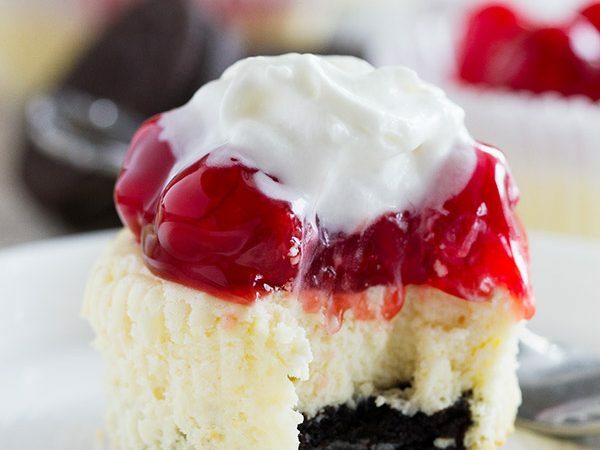 There isn’t a photo of every recipe, but there are still a decent amount of photos. Difficulty Level of Recipes: medium to hard. Let’s face it. Frying chicken can be intimidating. It’s not necessarily over the top hard, but it is not really a technique that a beginner will necessarily jump right into. Availability of Ingredients: easy to medium. 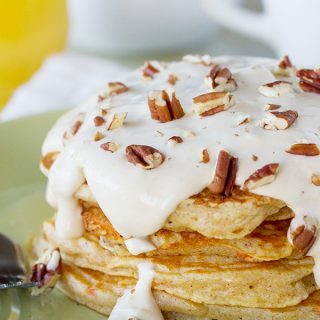 The majority of the ingredients in the book should be easy to find, but there are a handful of ingredients that may be a little more difficult. Buy Fried Chicken on Amazon. This chicken, you guys. This chicken. I don’t even know what to say, except – oh. my. goodness. The best fried chicken. Let me start from the beginning, though. In the beginning of the book, Rebecca Lang talks about the advantages of cutting up your own chicken. I had never cut up my own chicken, and have always been a bit scared of it. In fact, when I was shopping, I had decided that I would just buy a cut up chicken because I really didn’t want to cut my own. Well, there were no cut up chickens at the store that day, so I took a deep breath and decided to put my big girl pants on. The book has a photo of the pieces that you cut the chicken into, but it does lack a bit in instructing how to actually cut the chicken. I watched a youtube video, but had a hard time trying to watch the video as I cut up the chicken. (The video went a lot faster than I could cut!) In the end, I felt like I had chicken everywhere, my pieces were definitely not the prettiest, one of my breast pieces had no bone, and I broke the bone in one of my legs. But I did feel accomplished, and I’m sure I will get better as I practice. But I definitely won’t say it was the easiest thing ever. I would do it again, though!! The chicken gets brined for 6 hours, which is what I think gives it the amazing moistness. The the chicken is coated in a flour mixture, followed by honey and half-and-half, then another flour mixture, then it’s fried. The chicken comes out so crispy on the outside and moist on the inside, with a faint sweetness. 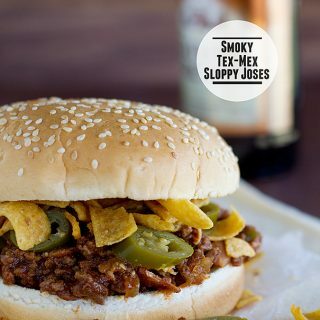 To top it all off, you can drizzle it with a spicy honey sauce (which I totally recommend). It doesn’t end there, as you also get some buttermilk biscuits. Now that’s what I call dinner. 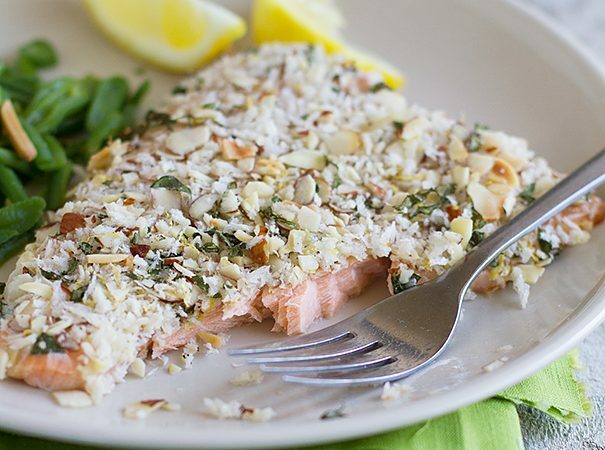 I do have to say that the coating is seasoned with Herbs de Provence, and I’m not the biggest fan of florally flavors, so I would cut way back on the amount of the herb next time. 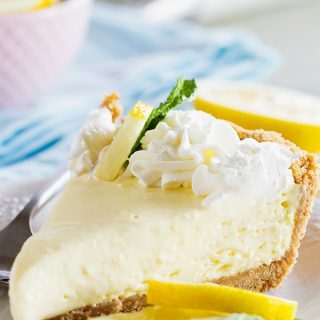 But if floral flavors are your thing, you will probably love the hint of flavor it brings. I was a little afraid that my chicken was going to be overcooked, because it did turn a deep brown color, but it was actually cooked perfectly. 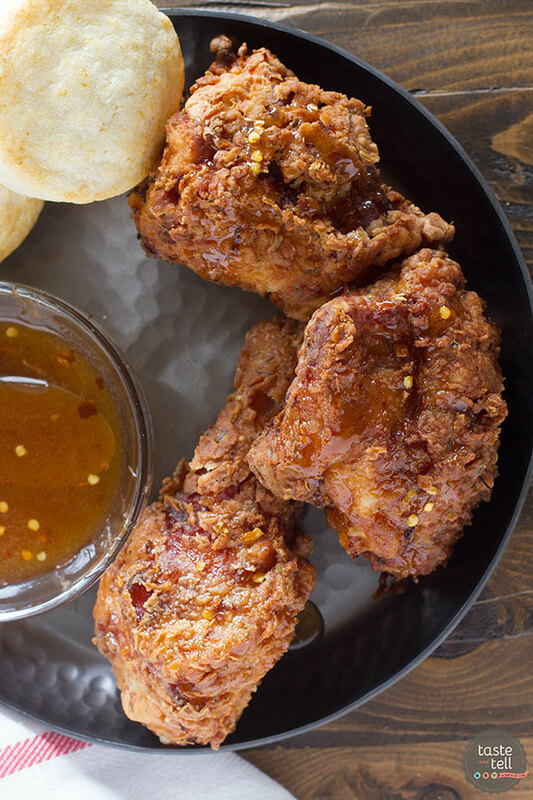 Simply put, this Honey Fried Chicken recipe will convince me to take up frying chicken. Maybe not super often, but I definitely will be frying chicken again! Combine the water, 2 tablespoons of the salt and the sugar in a saucepan over medium heat. Stir until the salt and sugar have dissolved. Remove the pan from the heat and allow to cool. Add the ice. Place the chicken in a large ziplock bag, then pour the brine over it. Seal the bag and refrigerate for 6 hours. Remove the chicken from the brine and discard the brine. 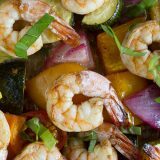 Heat 3 inches of oil in a deep fryer or a large, deep Dutch oven or stockpot to 340ºF. Place a wire rack over a baking sheet and set aside. In a medium bowl or a shallow dish, combine 2 cups of the flour, the remaining 2 teaspoons of salt and the pepper. In another bowl, whisk together the half-and-half and the honey. In a third bowl, whisk together the remaining 2 cups flour, cornstarch and herbs de Provence. Dredge each piece of chicken in the first flour mixture, followed by the milk and honey, then into the herbed flour. 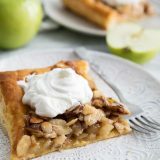 Place each piece on a clean baking sheet. Depending on how big your fryer is, you may have to work in batches to avoid crowding the pot. Place the larger pieces of chicken in the fryer and fry for 2 1/2 to 3 minutes. Add the remaining pieces of chicken and continue to fry for about 14 more minutes, or until the juices from the chicken run clear. Try to retain a frying temperature of 325ºF to 335ºF. When the chicken is done, place on the wire rack to drain. 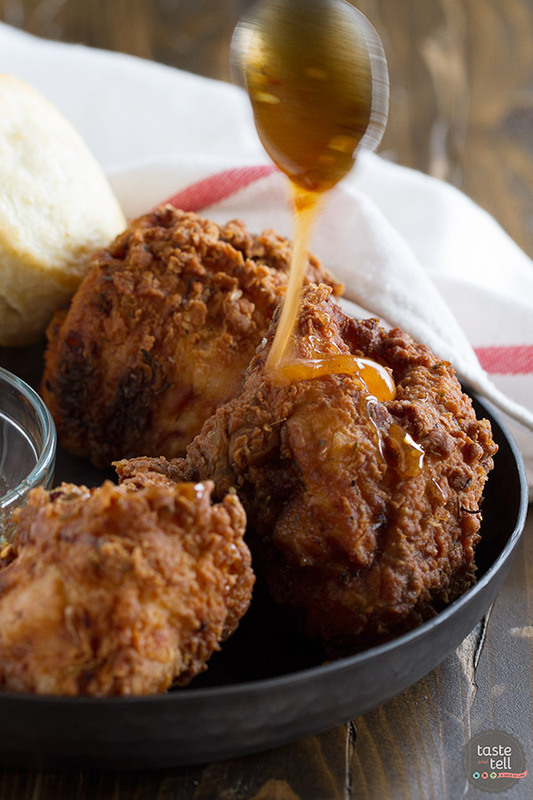 Serve the chicken with the biscuits and the hot honey sauce. Place 1 1/2 cups of the flour in a large bowl. Add the shortening, and use your fingers to break it up and distribute it through the flour. Pour in the buttermilk and the heavy cream and stir just until incorporated. Sprinkle about 1/4 cup of the flour on a counter or work space. Turn the dough out onto the counter. Using floured hands, knead the dough by folding it over and pressing it down. Continue to add flour as needed, 1 tablespoon at a time, until the dough is smooth and not sticky. Pat the dough into a 3/4-inch thick disc. Cut biscuits with a 2-inch cutter, pressing straight down and not twisting. 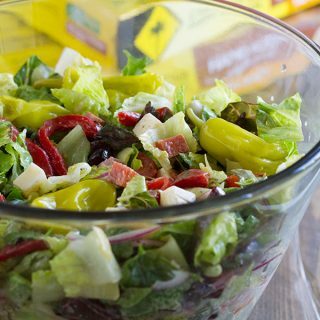 Combine the scraps and pat into a 3/4-inch thick disc and cut into biscuits. Bake the biscuits for 16-18 minutes, or until lightly browned. Combine the honey, hot sauce and red pepper in a small bowl and whisk to combine. Cover and store at room temperature for up to 1 day. *I thought the herbs de Provence were a bit overwhelming, so I would cut this amount by at least 1/2 next time. If you like the florally notes of herbs de Provence, though, feel free to use the entire amount. **I brushed my biscuits with a little bit of cream before baking. I received this book from Blogging for Books for this review, but all opinions are my own. This post contains affiliate links. If you purchase an item from Amazon from the link Taste and Tell receives a small commission. Thank you for supporting Taste and Tell through your purchases!. I’ve also tried baking them and even though it’s not the same taste, the sauce does a great job at masking it! Wow, this chicken looks amazing. I love Fried Chicken even though I don’t eat it very much anymore. Who can pass up chicken and biscuits? Yum. HOLY GUACAMOLE! you read my mind, been feelin the vibe! Even though we barely have finished up Thanksgiving leftovers,(still monjing on turkey dumpling soup), I know monjing is not a word, but means vehemently wolfing down,? Wolfing means… Anyway, fried chicken, the way you photoed it, the sauce… Thanks so much, making THIS week, Tuesday, no can’t wait, TODAY! HAPPY HOLIDAYS! Alton Brown does the best job hands down on explaining how to cut up a whole chicken (as well as craving a turkey). You should watch his video before cutting up your next bird. I’m definitely going to watch that!